In order to achieve goals, it requires active participation from anyone involved. One area where many people neglect active involvement is in their oral health, yet healthy smiles do not just happen. 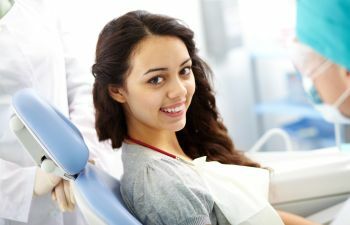 A healthy smile requires constant attention and the evaluation of your dentist on a regular basis. Flossing daily, brushing at least twice a day, and visiting the dentist twice for general dentistry are year are essential aspects of oral health. All of these work together to keep the teeth clean. But sometimes flossing and brushing are not enough to protect your teeth between dental visits – sometimes you need an extra “layer” of protection. Fluoride treatments have been used by dentists for decades to protect their patients’ teeth from decay. Every day, the mouth is under constant attack from acid-producing bacteria that call your mouth their home. These bacteria create the sticky, white substance that coats the teeth known as dental plaque. When plaque stays on the teeth for an extended amount of time, the teeth are vulnerable to developing cavities. Flossing and brushing are vital for removing plaque, but this is often not enough for some people. Children’s teeth are “softer” than adult teeth, thus more prone to developing cavities. Many adults are genetically predisposed to being cavity prone and developing gingivitis. For both children and adults, fluoride treatments can protect the teeth with a barrier that blocks the development of cavities. You only get one set of permanent teeth in your lifetime, so you must take care of them. Contact Bear Brook Dental to learn about the benefits of fluoride treatment.